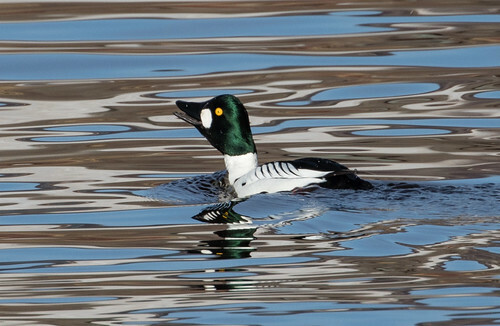 This morning, seven birders, my dog Pip, and I gathered at the parking lot behind the Willard Munger Inn on Grand Avenue in West Duluth, where the Western Waterfront Trail begins. This was the first Duluth Audubon Society Warbler Walk of the year. I knew we wouldn't spot a warbler quite this early, but nevertheless, spring was in the air. When I first arrived, a Song Sparrow was singing close to my parked car, though he quit before most of the participants arrived. But as we gathered, a robin sang persistently, and a couple of goldfinches sang and twittered. Two swans flew over right as we set out on our walk. Only a few patches of snow remain in the woods, and the river was mostly open, with large smooth patches of ice here and there. The marsh itself is still pretty frozen. 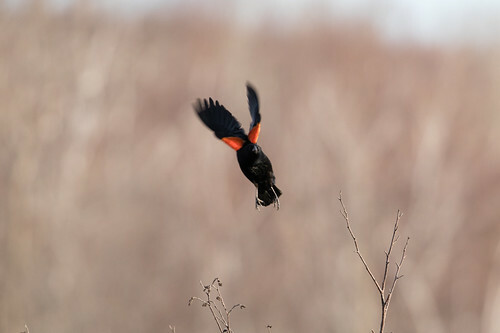 Several male Red-winged Blackbirds were boldly defending territories, but I don't think most are back yet, and we certainly didn't spot a female. Grackles flew past in flocks. I tried but couldn't find a Rusty Blackbird among them. Fishing is still tricky, but one Great Blue Heron flying over provided some evidence that there is some food available in the shallows already. 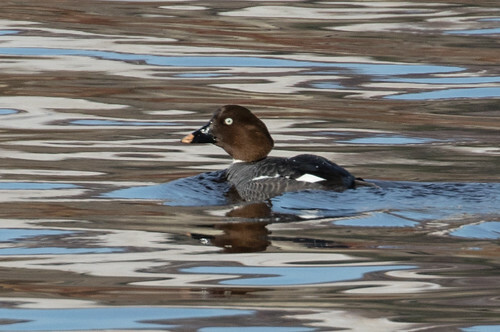 We didn't see any large flocks of ducks, but did have a nice assortment: Mallards, Ring-necked Ducks, Bufflehead, Common Goldeneyes, and all three mergansers, along with two distant Pied-billed Grebes. 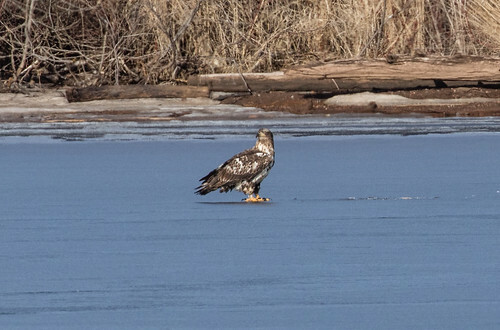 Just about everyone except me watched one Rough-legged Hawk circling way overhead—between cataracts and floaters, my poor old eyes couldn't spot it for the life of me. But oddly enough, my hearing aids helped me pick out both species of kinglets, though I didn't get a good look at either. 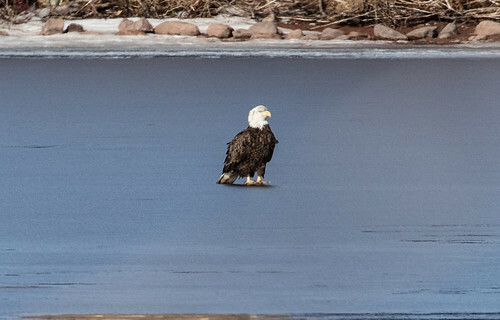 An adult and an immature Bald Eagle perched in a distant tree for a while, and then stood on the thin ice for a while. Juncoes are arriving, though not in huge numbers yet, and we found one gorgeous Fox Sparrow right on the trail beyond us. The Song Sparrows singing here and there were the only other sparrow species we saw so far. Goldfinches were here and there throughout the walk; their Pine Siskin relatives seemed restricted to the neighborhood with houses and bird feeders. We saw only a handful of robins, which all seemed to be singing males. These first arrivals settle in on their territories, giving them a huge advantage over pokier birds. Within the next week or so, we'll start seeing big migratory flocks of robins here, and by the time our local female robins arrive, the males will be pretty settled in. Females tend to get down to business as quickly as they can, so robins will start mating and nesting behaviors as quickly as pairs form. Black-capped Chickadees were singing persistently, and seemed to be spending a lot of time in pairs; some seemed to be considering possible cavities. 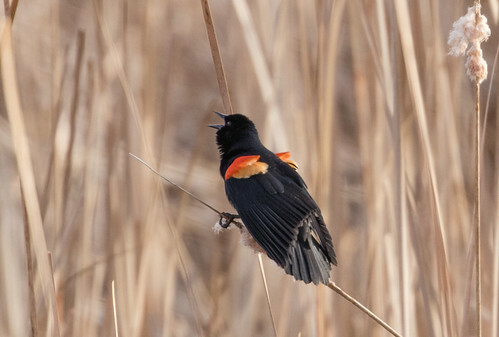 This week we saw 27 species; our daily list will grow each week as more birds arrive. I love getting out like this to the same spot week after week, to enjoy the progression of migration. 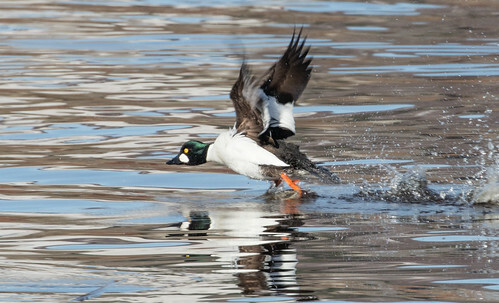 So I'll be leading these free, informal bird walks for Duluth Audubon at the Western Waterfront Trail every Tuesday and at Park Point every Thursday through the end of May. People show up right around 7, and anyone can turn around and head back whenever they need to to get to work. A few people come every week, and some just once or twice all spring—as I said, this is quite informal. Pip loves coming with me wherever I go, so she'll be along as long as she isn't too much of a distraction. If you find yourself in Duluth, come join us! Each week, I'll make a blog post for that Warbler Walk. This time I didn't get many photos. Here's the eBird list of the species we saw. If you were on the hike and have a correction or addition, or if you want me to share the checklist, please email me. Trumpeter Swan (Cygnus buccinator) 2 They were in flight and didn't call, but it was just the pair, and a couple of photographers showed me photos of four Trumpeters they'd taken there yesterday, so I am assuming they were Trumpeters. Ruby-crowned Kinglet (Regulus calendula) 1 In full song--I didn't see, but know the rich warble well.